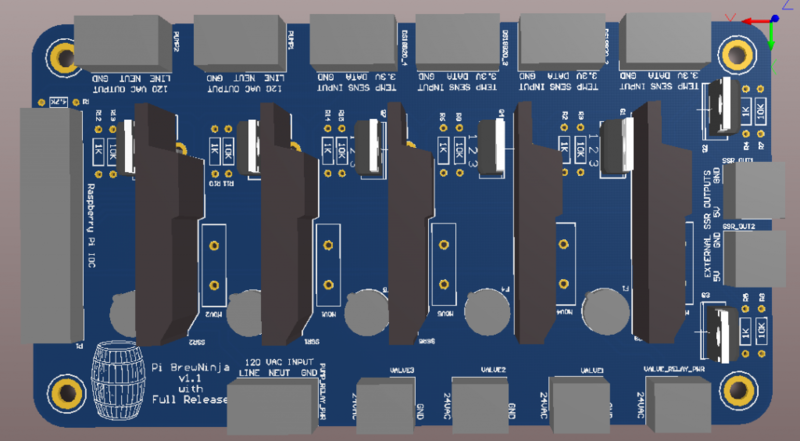 We plan to make some improvements to this design to make it less expensive and more useful for other applications (fermentation controller, hydroponics controller, more ubiquitous control interface– not just for the Raspberry Pi…). If you have questions about the design or how to use it in your own setup please feel free to send them to us. We will do our best to help out. The Keystone spring sockets are used for the solid state relays so the relays can be easily removed and replaced if needed. Since the relays are the most expensive part in the assembly some people may not want to install all 5 of them. It just depends on how you plan to use the interface board. I would highly recommend wiring in appropriately sized fuses for the 24VAC control outputs and 120VAC outputs. The fast blow fuses for each of the solid state relays are sized to prevent catastrophic failures, not to protect your valves, pumps, etc. Errata: The MOVs shown on the schematic are undersized, they should be considered “NO PLACE” when assembling the PCB. They have been removed from the bill of materials. I didn’t find that they were necessary anyway.